I know this may sound odd, being that I have a garden and everything, but I am not so great with plants. Well, let me qualify that. I am not so great with houseplants or plants in pots. I am miserable at watering them. If you read my garden post on watering you will notice that my garden is set up on a drip system and a sprinkler system and it is all on a timer. Do you know why? Because otherwise it would never get watered. I do not know why this is such an issue for me but it is. I am a terrible water-er. There. I said it. I confess! I actually had to tell my grandmother, who has the biggest green thumb on the planet (her house looks like a jungle because of all the plants) to stop giving me plants as gifts because it was such a huge waste of money. She would give me some beautiful (and expensive) potted plant or flower arrangement for say Easter and I would water it like twice and then it would die. And then it would sit there dead until Chris got mad enough to throw it out. And repeat. This year, when we created our outdoor beach oasis, we bought some plants to put on the beach to finish the look. We did this knowing full well that the plants would have to be brought in for the winter. Bringing them in was part of the process this weekend of shutting down the garden. So now, I have plants in my house. I have to say, plants make a crazy difference in the look of a house. Ignore the crooked blanket. Notice how the plant on the far left is looking pretty dead…it was outside of the watering area of the sprinkler…It still has some green in there so I think it will make a comeback. I’m not joking about the watering. This corner of my living room now looks completely different to me! And, I think next year when these plants go back outside I am going to think it looks very empty and naked! I may actually have to go buy some indoor plants. We’ll see. I am getting better at watering. Our lemon plant has survived two years of winters in the house and it is still going strong. 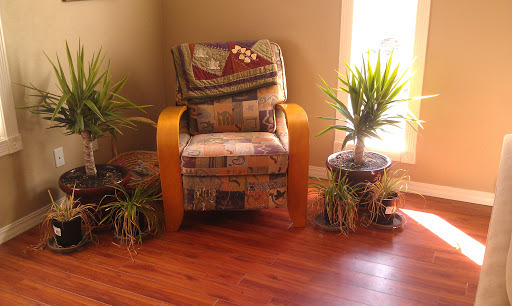 Maybe I am old enough to have houseplants now? 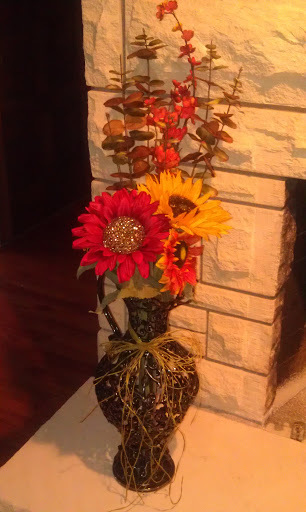 I had the black vase and I wanted to “fall-ify” it with some sunflowers. There are actually four different sunflowers in there and three other tall fillers. I had some raffia hanging around in my closet so I took and tied a bow around the neck of the vase. Ta-Da! My own fallified hearth decoration! Go me! The big red sunflower has a goldish-black sparkle center which tied in perfectly with the shiny black of the vase. I think it turned out great! I did manage to take down all my summer decorations, and have put a couple of fall decorations up, but I’m not done yet. Have you decorated for Fall? Can you keep houseplants alive? 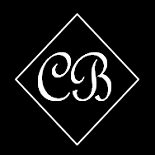 This entry was posted on October 15, 2012 by Corrie Beebe in decorations, random.